A lack of holding pools in the South Fork Nooksack River continues to limit the recovery of spring chinook salmon populations. The Lummi Nation will soon begin the second phase of a restoration project near Skookum Creek to improve habitat complexity, connectivity and climate change resilience for threatened salmon species. Twelve engineered logjams will create shaded pools for migrating adult and over-wintering juvenile chinook salmon and bull trout. Both species are listed as threatened under the federal Endangered Species Act. Several of the logjams will be placed downstream from a known cooler water stream, Edfro Creek, to provide temperature refugia in cool deep pools with woody cover. 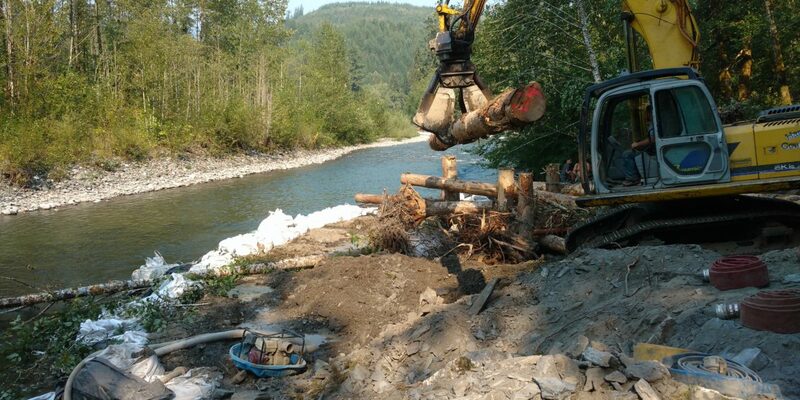 In the first phase of the project, Lummi Natural Resources constructed four logjams and removed 600 feet of riprap to open up additional woody cover. This project is less limited by permitting restrictions than previous projects downstream. “The logjams have been designed to be as close to the active river channel as possible to induce the most habitat response,” Levell said. The restoration aims to improve floodplain connectivity, which will provide refugia for juveniles and adults. Logjams also increase nearby riverbed elevations and slow velocities to protect incubating eggs from scouring floods. Records from 1883 describe logjams “across the river in nearly every mile” in the South Fork Nooksack. Now, not only is there a lack of wood in the river, but Lummi Natural Resources staff also have found that what’s there is not providing cover in the low-flow channel during summer months. Surveys have found chinook spawning only in a portion of their historical habitat. This entry was posted in Uncategorized and tagged Last Real Indians, LRInspire, Lummi Nation, salmon by lrinspire. Bookmark the permalink.